Court testimony about the recent Toyota ruling makes for interesting - and depressing - reading. A lot of code was involved and some of it was safety critical. Yet it seems the firmware was poorly engineered. No doubt the typical mad rush to get to market meant shortcuts that, at the time, were probably seen to save money. A billion dollars later (with many cases still pending) that judgment looks more foolish than sage. Agilent has a free 89 page application note called "Spectrum Analyzer Basics" that I recommend. Spectrum analyzers (SA) look like oscilloscopes, but the the horizontal axis is frequency rather than time. You have to register to get the app note but if an SA is in your future - or if you're curious about this aspect of electronics - this is a great resource. If you're not familiar with heterodyning you'll be lost. Wikipedia has a good article about heterodyning, which is something all EEs should understand as it has been a staple of radios for just under 100 years. 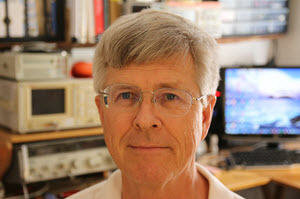 Most digital oscilloscopes can compute the FFT of the input waveform, transforming it from the time to the frequency domain, in effect simulating a spectrum analyzer. However, scopes don't have the exquisitely-sensitive RF front end of an SA. A scope digitizes voltage and displays the result; an SA sweeps a local oscillator over a wide range of frequencies and mixes it with the input. In effect it's a radio with a swept local oscillator, so is internally much different from a scope. This is a typical FFT on an oscilloscope simulating a spectrum analyzer. The top trace is the signal in normal volts vs time format. The bottom trace is its Fourier Transform and is shown as dBV vs frequency. The input is just a meter of wire acting as an antenna; the displayed FFT is for the commercial FM radio band. 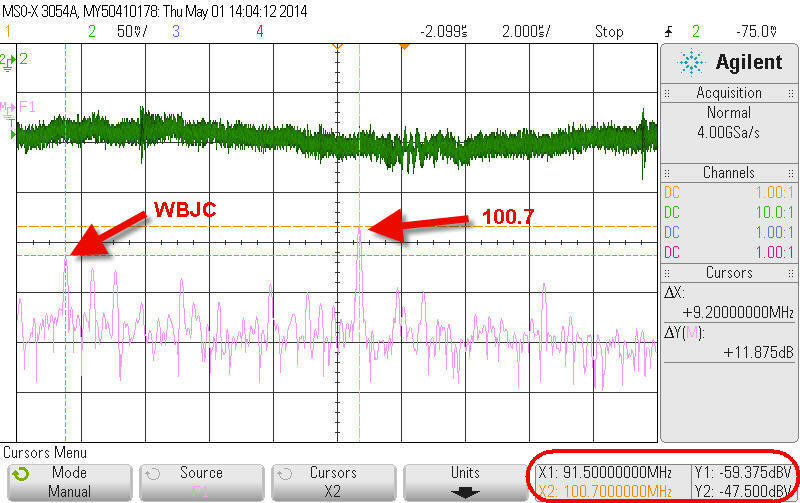 The peak at 91.5 MHz is WBJC, Baltimore's classical station; at -47.5 dBV that's about 4 millivolts. A rock 'n roll station at 100.7 MHz is quite a bit stronger. But do notice how the FFT extracts useful information from the scope signal that looks like meaningless noise. In the last issue Phil Koopman graciously let me run his blog piece about not re-enabling interrupts inside an ISR until the routine has completed. It created a lot of dialog. Most of the correspondents addressed two points. The first is that modern CPUs do support multiple priority levels, so much of Phil's argument didn't pertain. That was my initial thought, too, except that at the very end, prefixed with "UPDATE," he specifically dealt with those architectures. The second point is that if an ISR is longer than a handful of lines of code, there's a design problem. Keep 'em short! I completely agree. But, in general, it's hard to generalize about embedded systems, and I have seen a few cases where long, even very long, ISRs were the only choice. Those cases are rare. Perhaps the shortest ISR ever written consisted of one line of code, except that there was no code. Decades ago we built instruments that used the 8008 and later the 8080 processors. When a device requested an interrupt the CPU responded with an interrupt acknowledge cycle, which was a normal fetch with an INTA strobe line asserted. External hardware would usually drop a single-byte call instruction on the bus that invoked one of seven ISRs. The overhead required for a call far exceeded the few microsecond response time we needed, and happily the system had nothing to do while awaiting the interrupt. So the code would execute a HALT instruction and stop till the interrupt occurred. In response to the interrupt-acknowledge cycle the hardware placed a NOP on the bus; the code restarted and carried on, reading the A/D and doing all of the other stuff that had to happen when the event occurred. I read that you plan on reviewing the SDS 1000CML oscilloscope. I bought a Rigol DS1102E last fall ($399). It looks about the same as the SDS 1000, probably made at the same factory. I use mine a lot and think it is a good scope for $400. The bandwidth limit of 100 MHz does limit looking at high speed clocks, but for most of my embedded designs, it is fast enough. I could use 4 channels sometimes, but I get 90% of the work done with 2 channels. The measurement features are good, I especially like the "Display All" button, it shows all 24 measurement features at once (takes up 1/3 of the screen). As for quality, the Rigol has worked well for me the last six months, and I do take it home when I plan to work at home. Nice to avoid the commute. The size and weight makes it easy to carry. I looked at 2 channel USB oscilloscopes, which cost around $150 - $250. I read many reviews of the USB scopes; several users complained about the quality & units failing. A few bad reviewers suggested the Rigol. For $100 - $200 more, I get a stand alone oscilloscope that does not need a laptop to run it. Conclusion: I am happy with the Rigol and I recommend it. What could be better than winning a free trip into space! The folks at Hackaday are sponsoring a contest for the coolest bit of electronics; you have to build the gizmo and show it works. A number of prizes are offered. The grand prize winner will receive a trip to space on their carrier of choice, or US$196,418 cash. Other prizes include team skydiving, an all-expense paid trip to the Akihabara electronics district in Japan, and essential hardware hacking tools such as milling and tooling machines and 3D printers. The contest closes August 4. 27. I remember the last time I saw it do that. 26. I don't think it should be doing that! 25. I have never seen it do THAT before! 18. .. and I just bought that Coke. 12. I got a better job at Lockheed. 10. Well, it's doing SOMETHING. 6. Wow!! Look at this!